Spring is here. The flowers are blooming, the sun is warming things up, and it’s time to shed the heaviness of winter and get light on our feet outdoors. This season is a good reminder of rebirth, the power of shedding old clothing (and thoughts), and nature is sometimes the perfect reminder of the blessing of now. Some would argue that this is D.C.’s most wonderful time of the year. The National Cherry Blossom Festival is from March 20 — April 14 at the National Mall. Along with viewing the beautiful trees, visitors can enjoy food vendors, street fairs, musical acts and fireworks. The U.S.- Japanese celebration commemorates the gift of 3,000 cherry trees to the U.S. from Tokyo, Japan, in 1912. Up to 1.5 million people visit the festival each year. Let’s be honest. Warmer weather is always the perfect excuse to drink, but why not learn something as well in the process? Northern California is home to Napa and Sonoma, ideal options for any wine lover or person looking to learn a little bit more about notes and varietals. Both areas offer a number of tours, on trains, in cars, and even by foot. Tourism professional Bruce MacKay offers specialized private tours and has an incredible relationship of many of the areas vineyards. You can schedule an outdoor adventure with his company, Vin de Luxe Tours by clicking here. You can also enjoy how spring blooms from above with a hot air balloon ride with Up & Away Ballooning. Stretching 20 miles, the Bollenstreek in Amsterdam is where you’ll find the famous tulip fields. You can even spot the endless flowers as you land into the airport. The best time to visit is mid-March to mid-May, and in April, tulip lovers will get their fix during the annual Tulip Festival. If you enjoy biking, there are a number of options to enjoy the flower fields — and city. The tulip field route has an easily navigable bike path and Bike van Dam offers routes that are a flower aficionado’s dream. This green wonderland will have you feeling like royalty in your own fairytale. 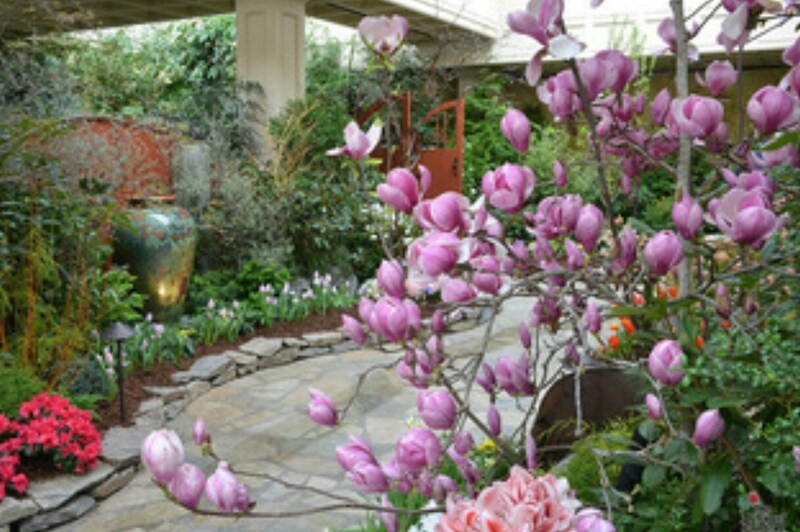 From March through May, the gardens produce thousands of new bulbs. You can visit their blog to see what is blooming currently. There are 55 acres of gardens to explore, including a rose garden, twelve-point pond, and gift store where you can take home seeds to plant. There is also a kid’s carousel. Living Desert, Palm Desert, Calif. Though the area is well-known in March for Coachella, Palm Desert is an outdoor lover’s playground. The Living Desert is 1,200 acre wilderness preserve that includes a zoo, botanical garden, and nursery. You can feed giraffes for $7, and the views at sunset are worth the trip alone.